“Promise we’ll have another fort at the next house?” the girls asked. It was 2010 and we were moving to fit our growing family. Two years before we’d built a play structure for them, adapting it mid-way through as, the then-toddler, Avery broke her leg and needed larger stairs. Avery, age 2, and her purple cast. Briar hiding behind the canopy. “Sure, we’ll build another one,” we said. 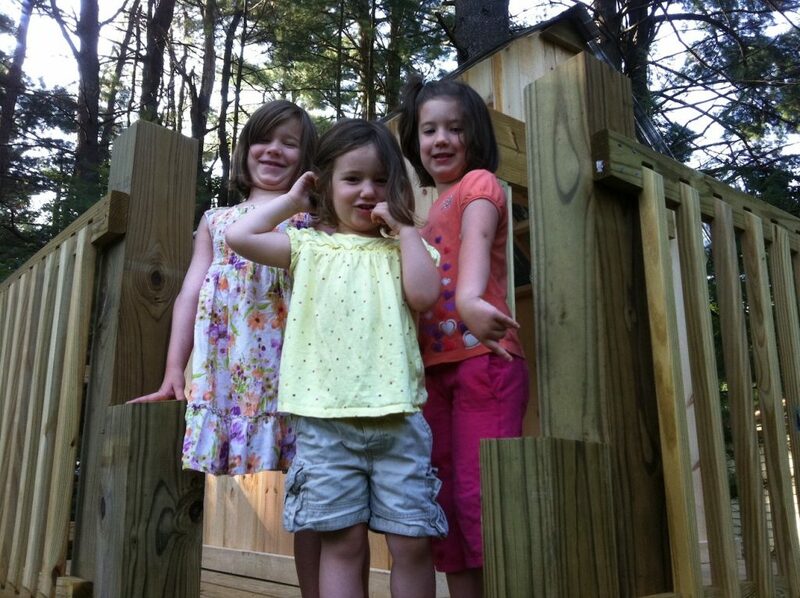 The girls gave the fort a fond farewell and whispered that they hoped the next family would enjoy it. The new house had a deep wooded lot and we decided to build the structure into the ring of trees. It took a lot of tinkering and reconfiguring as we anchored 4x4s into pine trees. “It doesn’t have to be perfect. It just has to be safe.” The girls stayed close as we planned it, suggesting additions along the way. “How about if you make a kind of ladder for us?” they asked. 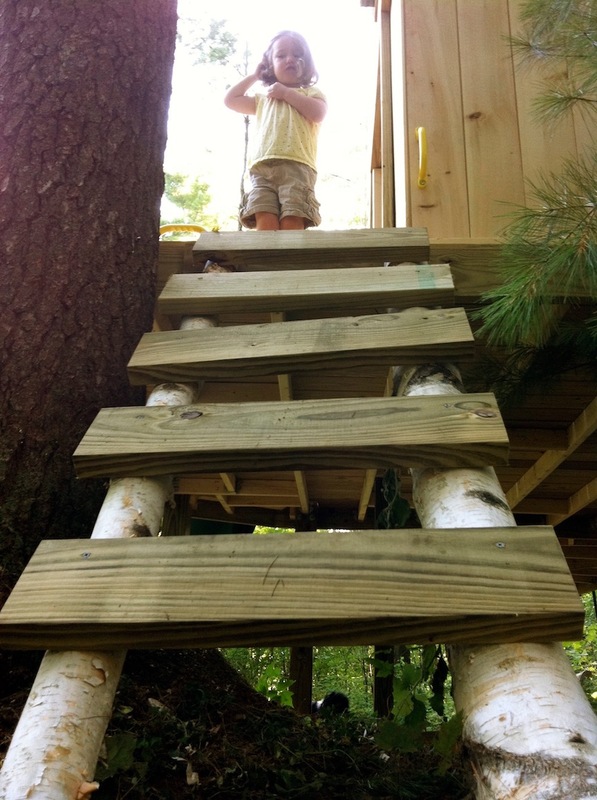 Sean found birch trunks and made a ladder of sorts. It took us the better part of the summer, but we got it done. Briar immediately climbed along the outside of the railings and I realized this tree house was going to be different from the first. Finley was no longer a baby, Avery was more kid than toddler, and Briar was going into first grade. The girls would gather dolls, tools, walkie-talkies and blankets and stop in the kitchen, “Hey mom, could you bring a snack plate out for us?” I’d coined the “snack plate” phrase one day when I realized that the Pirate Booty wasn’t going to stretch far enough for the girls to each have a serving. I put half a dozen types of crackers and assorted bits of fruit on a platter. Scarcity turned on its ear to options. I loved watching them parade across the grass and toward the tree house. Finley would sometimes drop things and have to rearrange her arms. Eventually, she used a picnic basket or a briefcase to carry her things to the fort. They’d disappear for hours to play. There were windows through which I could see them moving and I’d watch from the kitchen. The idea that childhood rushes by had taken root in my heart and each time they played together it felt like time slowed. It was a fortress, but growing up happens no matter how you build. Finley said to me the other day, “The shirt grew out of me.” She wasn’t ready to be done with the shirt, but she knew it didn’t fit any longer. I wish I could be as pragmatic, outgrowing still makes me choke up, even as I know it’s what we are all working toward. Birthdays filled the yard with sounds, the backdrop of the fort and trees always drawing exclaims and “Let’s go!” from their friends. 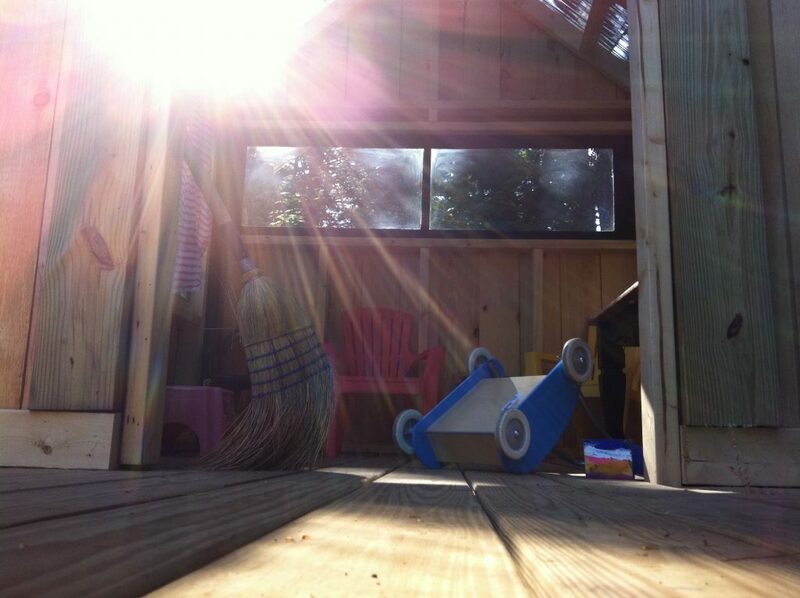 One summer night I added strings of solar lights and then gasped aloud when they began to twinkle the following night. The girls dashed outside to look and later that night we spread quilts out to sprawl next to one another as we watched bats swoop for bugs in the fading evening light. We played summer right into fall, gathering for campfires beneath the trees as the night air grew cooler. 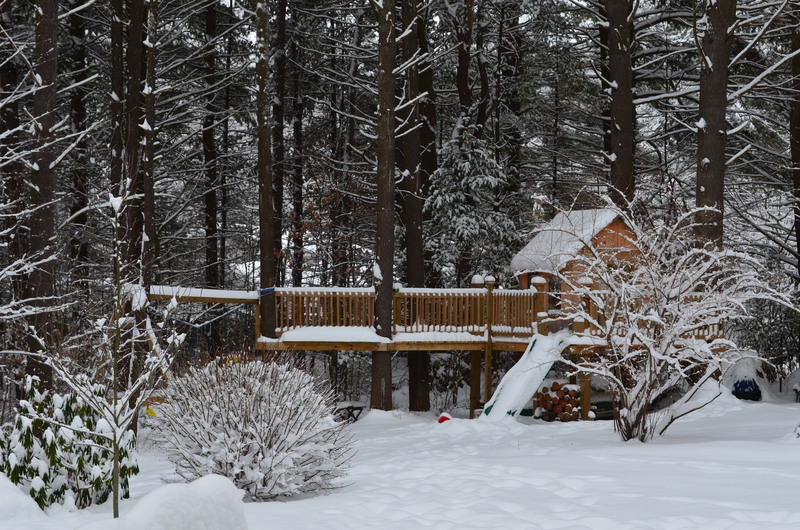 Then came winter—snowy slide rides, playing beneath the decks to weather the storm. I’d pour my coffee looking toward the treehouse. The move had been good for us. 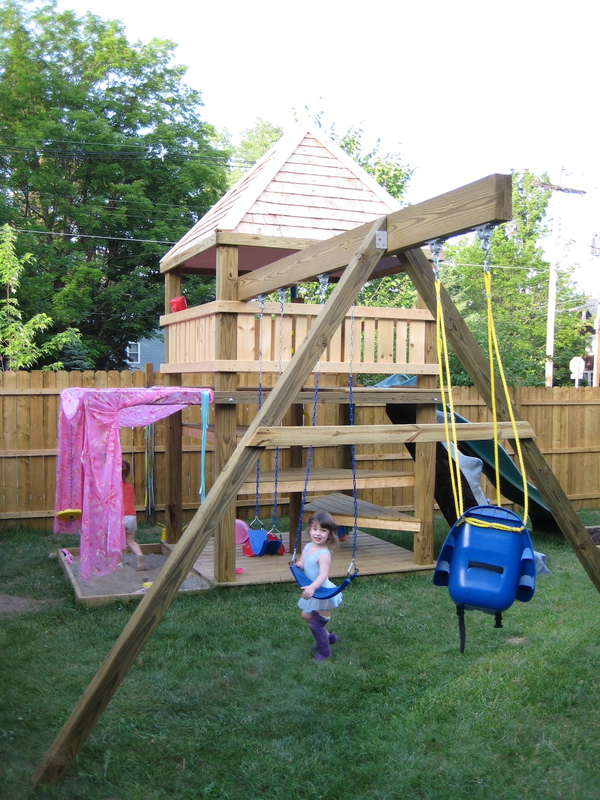 This yard embraced us and gave us eight years of playing and loving. We’d outgrown our house, just as we’ve begun to outgrown this house. 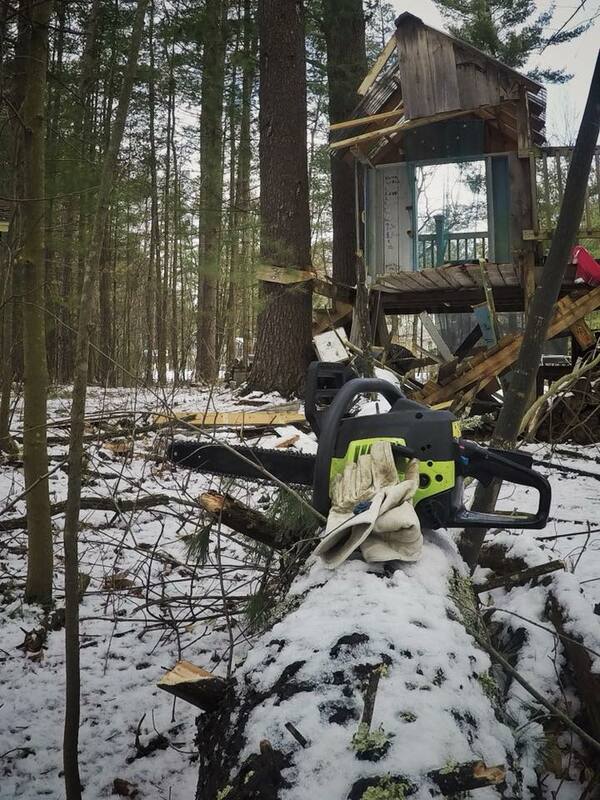 I stood up and we walked out toward the treehouse. “Do you see how the curtain is blowing out?” She asked watching my face. Then I saw it. A pine tree had snapped during a windstorm and fallen onto the fort, shearing off the backside of it. Two of the windows shattered, two did not. Once again Fin was matter of fact. “We need to clean it up,” she said. “Can I help you?” I was still trying to process how it could be gone and how I was going to manage my broken heart. We took truck loads of lumber to the dump and made plans to preserve the parts that had not been crushed. 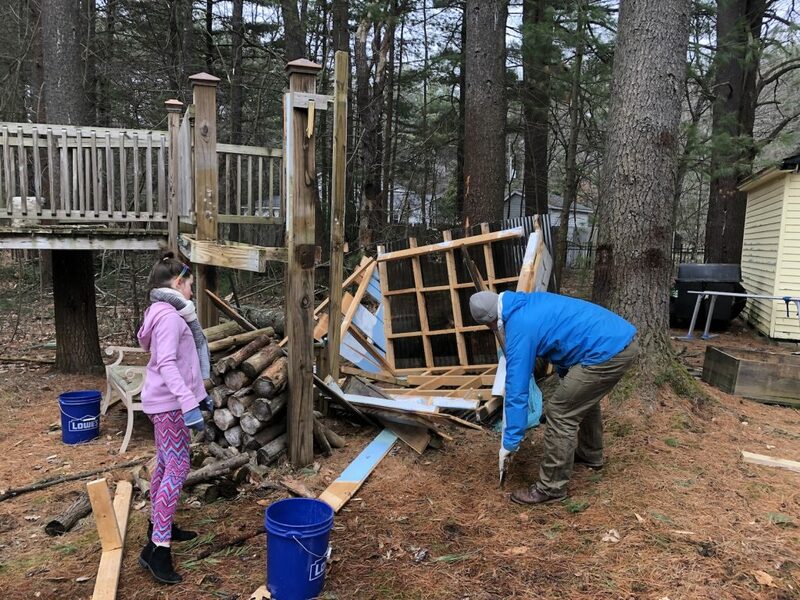 “The swings can stay, we can move the slide over here, and redeck that section,” Sean said gesturing toward what remained. This is what I am learning about childhood, time, and life—it breaks in unexpected ways, meets you in the outgrowing, and reveals new ways in which you can adapt and continue to love. That is such a wonderful comment. Thank you so very much!